I’d sooner wash windows than paint walls and I’d sooner clean floors than do anything in the garden. But when it’s not my wall or my garden … that’s a different story. While I’m no stranger to volunteering, I tend to opt for things I can do on my own as I’m not big into group activities generally (am quite anti-social really, when I think about it). But there’s something quite unique about volunteering with the IHBC‘s Give a Little campaign. This was our second trip to the Topház Speciális Otthon in Göd (a state orphanage), the first having been voted a roaring success back in July. I’d expected pretty much the same crowd, yet I found that I only knew a handful of those who turned up at Nyugati to cadge a lift down. 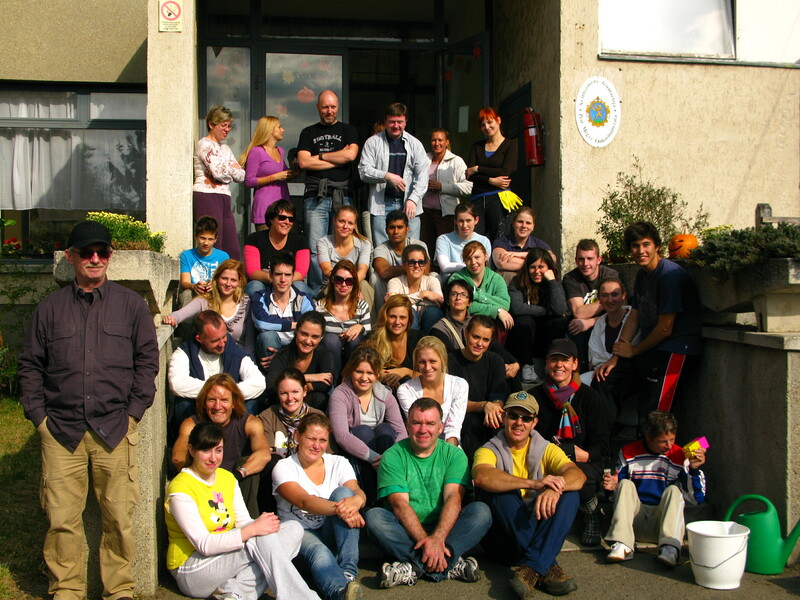 The majority were students from Semmelweiss University – future vets, doctors, and dentists – all giving freely of their time to paint one of the wards and clean up the grounds. 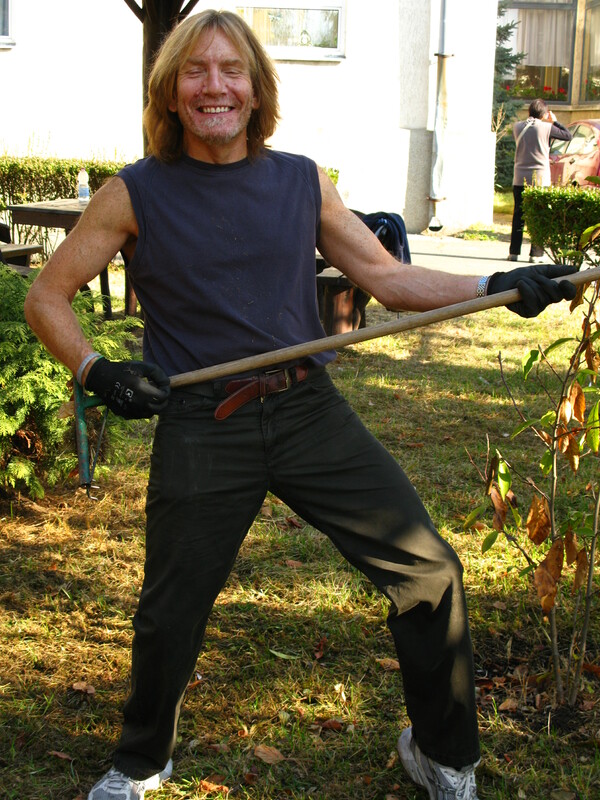 Given that it was such a gorgeous sunny day, I opted for the garden duty. 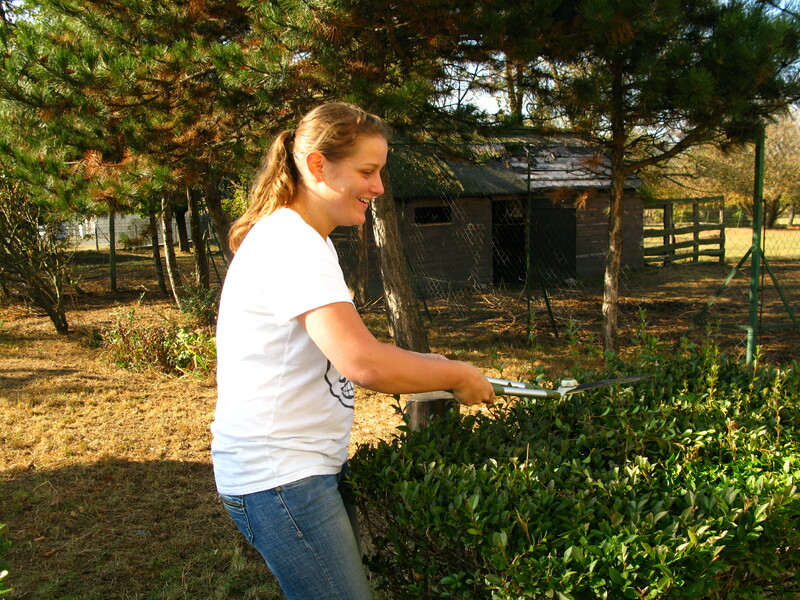 We raked leaves, trimmed hedges, dug weeds, planted shrubs, played air guitars on shovels, horsed around on spades, got to use a hedge clippers, rejoiced in our welts and callouses, and generally had a blast. Who would ever have thought that hard work could be so much fun. I have a theory. I can’t speak for anyone else, but this is how I see it. Volunteering for these work crews gives me something I don’t get from my normal, everyday life. I get to go in, work like mad (well, I have a blister or too! ), accomplish something, have some fun, and then get to stand back and see the fruits of my labour – all in a matter of hours. Multiply that feeling by the 40 or so people there today and you get a lot of work done and a lot of satisfaction from doing it. That sense of achievement, that reward of almost immediate gratification, are priceless. Those who live in the orphanage year round don’t have it quite as good. For them, there is no going home or going back to a normal life as I know it. But the staff really seem to care and the lads who are ambulatory laugh a lot. For many, it’s a blessing that they don’t fully realise that they’ve been given up by families who, often through no fault of their own, simply couldn’t cope with their disability. For me, as a volunteer, it’s a blessing to be able to do something to help. And not for the first time, I’m left wondering who really wins from these days out. I have sneaking suspicion that I get far more than I give. If you want to get involved, sign up to the IHBC facebook page or website or come support the Gift of the Gab, the proceeds of which are going towards buying a bed for Norbert. I feel envious that I couldn’t be there today, because you are right about gaining the most. You have expressed my feelings. I think that this experience at Topház has changed everybody a little bit. Not too sure the painting crew had as much of a laugh (the foreman was a grumpy old git keeping everyone busy – me) but we achieved loads, have been happy with our results, we freshened up the rooms with new wall paint and decoration and in the process tapped into the artistic skills of some future medical practitioners. The newer buildings at Tophaz are probably no more than 5 yrs. old and in good shape, but the main building, built in the 60’s / 70’s requires some major attention and funding. There is a need for door frames and doors, new flooring and bathroom fixtures designed for institutional use and furniture – you can tell that everything has been done on the lowest budget or via kindly donation for too long now. Unfortunately Tophaz is one of 13 (?) such homes in Pest County alone. I left feeling happy & fulfilled, but frustrated realising that these types of insituition are closed off and out of sight of the public, behind a fence and gate whose residents do not rank very high on the priority of funding bodies when actually they should be provided the very highest level of care and accomodation. Lovely article Mary. Great day out, and well worth doing. Simon’s right – but I have a feeling that these articles, and chatter from the people who got involved, might bring this place (and places like it) to the attention of people who can get in and do those jobs he mentioned. Meanwhile…..pass the hoe…. A very good article and your paragraph “Those who live in the orphanage year round…” really sums it all for me. I was also very interested by Simon’s comments about funding. The poor state of these institutions is reflected in the poor state of many public buildings throughout the country. Many schools and hospitals are in a terrible state but as young fit expats we tend to go in ignorance of how bad thing are.